John Wells’s phonetic blog: are two heads better than one? When I was writing my intonation book (English Intonation, CUP 2006), one point that I tried to make clear is that some aspects of intonation are more important than others. This is particularly relevant to EFL learners, who would do best to concentrate on the major issues and ignore, or at least leave till later, various minor ones. So I organized the book in such a way that — after a brief introductory chapter — one chapter is devoted to each in turn of the “three Ts”: tone (falls, rises, and fall-rises), tonicity (which words do we accent? ), and tonality (how do we divide the material up, where do we place boundaries?). The matters I regard as “the less crucial choices” (p. 10) I relegate to chapter five, “Beyond the Three Ts”. Among them are the prenuclear part of the intonation phrase (preheads, different kinds of head), finer analysis of tone (e.g. high fall vs. low fall), non-nuclear accenting, major and minor focus, and a discussion of which function words are (against the general rule) typically accented. Now I read in David Deterding’s blog an account of a presentation given in China by my colleague Francis Nolan, who made an additional point. However, it is not so important to imitate the finer distinctions of the intonational tunes of native speakers, partly because there is a huge amount of variation in tone usage in Britain and elsewhere, so listeners are accustomed to hearing substantial differences among the people they talk to. To support this, he played lots of data from speakers from around the UK and Ireland. I think this is exactly right. Deep down, nearly all native-speaker varieties agree very substantially in the way they use intonation. Superficially, there are considerable differences in the details of pitch movement. While [the account of different types of head] is almost certainly an accurate description of the intonational patterns of native speakers of RP British English, there is no way that listeners will misunderstand the message if a non-native speaker uses a rising head rather than a high head. But the questioner was adamant that the distinction is absolutely vital. It is in the book by John Wells, she insisted, so it must be important. You can see my dilemma. If I hadn’t included the possibility of rising heads in my account, I would have been rightly criticized for lack of completeness. If I had followed the O’Connor and Arnold (1973) model, and presented rising head plus high fall as one of ten apparently equally important tunes — this is their number 6, the “Long Jump” — I would have failed to make the point that the distinction between this pattern and high head plus high fall (their number 2, the “High Drop”) is not actually terribly important. I have assured David that I agree with him and with Francis. Perhaps in the book I ought to have made my point more clearly, so that all my Chinese readers could grasp it more readily. This might be an ignorant question as I don't speak a tonal language, but could the use of tones as integral components of syllables in Chinese have something to do with Chinese speakers being more sensitive to intonation patterns in English? Where speakers of non-tonal languages would hear the usual range of free variation in actual patterns of intonation, perhaps Chinese speakers can't help hearing clearly different intonation patterns in each utterance and thinking all these must be important distinctions for native speakers of English. If so, one could go on thinking that there must be one 'correct' way to intone like an RP speaker, dismissing the examples of speakers from across the UK and Ireland as illustrations of mere 'dialectal' variation, just as different dialects of Mandarin have different tones from Standard Mandarin. What Chinese speakers find very difficult is the second T, tonicity. They need to work very hard to understand how and why native speakers deaccentuate out-of-focus material. It's probably not just a Chinese mentality—I think one often finds it simpler to think of something as either correct or incorrect when one learns a foreign language. Could it be that Chinese speakers are more likely to pay attention to tones at the syllable level? If I think about intonation at all, I would only pay attention to whether the entire phrase is rising or falling; 'heads' are a new concept to me, because I never stopped to think about such small units of intonation. But if I spoke a tonal language, I could see how I might be more sensitive to the tone contours in these smaller units. On the other hand, I might have more trouble with more global patterns of intonation, which are probably more important in English. As for tonicity, I imagine speakers of lots of different languages have trouble with tonicity in English. Chinese intonation is superimposed on top of syllabic tone, anyhow. But (I haven't read the book) is AmE tone really so easily unified with the rest? As I commented during the latest hiatus, if I superimpose the tone of BrE on my own accent, the result sounds extremely strange. Intonation is one area where my knowledge is lacking. Does anyone know where I could learn more about it (besides English Intonation)? I'm a native speaker of English, but I would just like to be able to understand what linguists are talking about when they say things like "high head plus high fall", etc. The last anonymous poster was me. 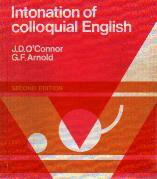 @ Anonymous/Phil: I learned a lot about English intonation by reading "Intonation of Colloquial English", by O'Connor and Arnold (you can see it above). It's an old book which used to be quite cheap before J. Wells talked about it in his "English Intonation".